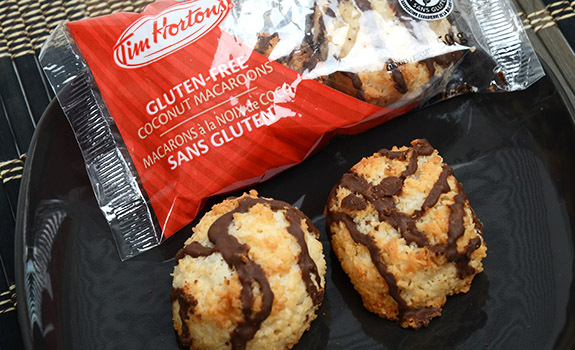 A package of Tim Hortons Gluten-Free Macaroons. If you have any celiac friends, you already know how hard it is to find gluten-free things to eat at a restaurant or café. Every label must be read, and nothing can be left to chance. Asking a staffer if something is gluten-free is regularly met with blank stares, or, worse: incorrectly stated confirmation that something is gluten-free. Vegetarians also know this kind of frustration – even vegetable soup could have been made with chicken stock, and servers don’t always know this. In a coffee shop like Tim Hortons, gluten is king. Donuts, cookies, muffins, bagels, croissants, sandwiches … all gluten-laced delights. Even menu items without bread or obvious wheat flour are at risk, either because of stealth ingredients (flour is hidden in an amazing array of things), or because people get lazy and don’t clean work surfaces. Depending on your level of gluten sensitivity, it’s a health minefield. Which is why I really do applaud Tim Hortons for introducing at least one guaranteed gluten-free snack treat to their shops. Starbucks has had GF snack bars for ages, but it’s good to see that a Canadian institution like Timmy’s has jumped on board. The Pitch: Marked with the Canadian Celiac Association’s gluten-free seal. Also: “Product of USA.” Say it ain’t so, eh? The Look: Packaged in plastic, and for a reason: these were no doubt made and packaged in a gluten-free facility, allowing them to avoid the obvious problems of Tim’s employees handling them with gluten-tainted gloves or tongs, or placing them on racks next to the donuts. 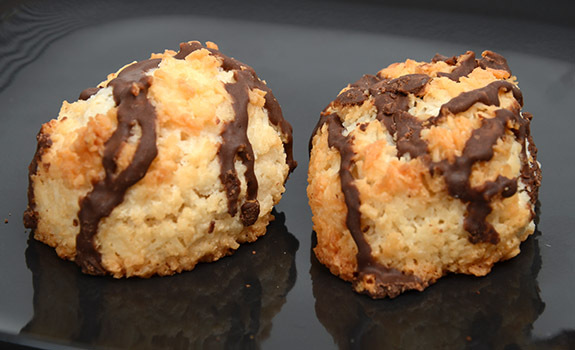 The macaroons are coconut lumps drizzled in chocolate (technically Chocolatey Drizzle, as per ingredient list), about the same size as a very large Timbit. The coconut is toasted into a semi-hard shell. The Taste: Shredded coconut texture that’s crunchy on the outside and soft on the inside. Almost oversweet, with a hit of vanilla and almond, in the style of cheap marzipan. There’s a dull greasy, oily feeling that lingers for minutes. The icing sugar sweetness is much like that on a powder-coated donut. A closer look at the texture of Tim Hortons Gluten-Free Macaroons. Chocolatey coating, anyone? Cost: $1.29 for a two-pack (50 g) of Coconut Macaroons. Nutrition? : Per 2 cookies (50 grams): 250 calories, 14 grams of fat (of which a whopping 13 grams are saturated! ), 25 mg of sodium, 4 grams of fibre, 3 grams of protein. The verdict: Not great, but still a nice option to have around for those who need it. Granted, these are as unhealthy as just about anything else at Tim Hortons (note the saturated fat level?). But at least it’s an inclusive sort of unhealthy.